I love doing house flowers. Our Bride, Lauren was married at her Grandmother's house in Somerville: an old Victorian. She chose some colors, I suggested some colors and we came up with this pretty palette. Again, I relied on the Bride for photos who just emailed these pics from her big day. I LOVE that palette. It's a keeper. Nothing like a home wedding. Beautiful flowers, as usual. Very lovely. 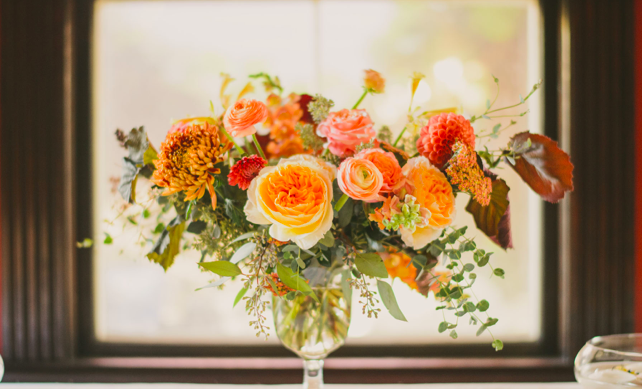 Autumn colours, wedding beauty. Beautiful. Is there a mum in there? Jane! Mums in the Fall only. And lovely they are!